Contents: Click on each link to quickly get where you want to go! Will Sperzels fit on my Instrument? God if this is meant to be please make it happen with all your Blessings; and please only bring me worthy customers; and keep me Protected. I ask this of you in Jesus name. Pricing for 6-in-line, 3x3's, etc.. These keys incorporate the standard "Thumb-Locks" just like the more commonly seen "Trim-Lock" Sperzels! 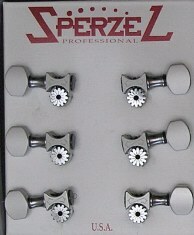 These are my personal favorite tuner that Sperzel makes. 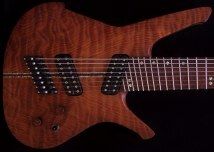 If you need a 5 string set, or more strings, just add in the price of a single key(s) to the price of your set of 4 keys. 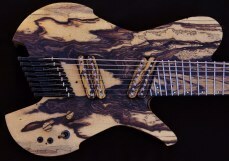 Note: Please be sure to specify if you need a D Thing for your "Parker Fly" guitar. Please note: only #2 and #6 guitar buttons available in ivory and pearl. 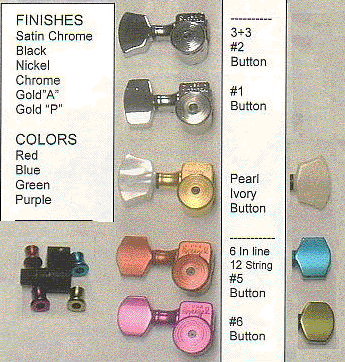 You may choose any of these (non Pearl or Ivory) button styles (shapes) to be installed on your Sperzel tuner order free of charge; as long as the buttons match the exact color of the tuners that you are ordering. Tuner sets with different colored buttons, are considered multi color combo tuners, and will vary in price. PLEASE NOTE: # 2 buttons will most likely only fit 3X3 style head stocks, and are NOT recommended for use on most standard 6-in-line style head stocks, because they may contact each other when installed. To order ONLY button sets by them selves please contact me. $21.00 per set of 6 ($3.50 each) Faux replacement buttons in: Pearl, Black Pearl, or Ivory. $13.20 per set of 6 ($2.20 each) separate Gold Plated replacement buttons if ordered not-attached to a custom set of Sperzels. $12.00 per set of 6 ($2.00) replacement buttons in your choice of: Red, Purple, Blue, Green, (satin-anodized) Gold, Satin chrome, Satin Black, Chrome plated, Nickel plated, if ordered not-attached to a custom set of Sperzels. Please see important note on setups, before placing your order. If you just need a standard setup of: 3X3 Guitar, or 6-in-line Guitar, I can supply you with these no problem! Left handed (or reverse head stock) setups for Guitar or Bass. Just about any setup you need! 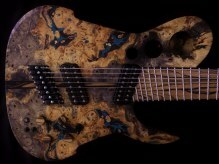 Add on, or subtract single tuners, so that you can create your own custom sets multi string 5, 7, 9, and 12 string Guitar or Bass. Please be sure to specify what side of the head stock you want each of your tuners to be on, as seen while facing the head stock. Standard right handed "Strat" has all of it's tuners on the left side of the head stock, (as seen while facing the head stock). Please be absolutely sure of this before you send me your order. Just one of many cool color combination possibilities! The "tuner post" (the part where the string wraps around) on ALL colored (red, blue, green, purple) Sperzels is chrome plated.. The mounting nuts and washers are also chrome plated on all colored (red, blue, green, purple) sets. All Gold plaited tuners have gold plaited nuts and washers, and gold plated posts. All Satin Gold tuners have gold plaited nuts and washers, and gold plated posts. 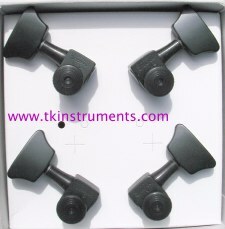 All Black tuners have black mounting nuts and washers, and chrome plated posts. All Nickel plaited tuners have nickel plaited nuts and washers and nickel plated posts. Shipping is only available to the USA Lower 48 states. International orders are *not available through this web-site. *International dealer inquiries, should contact Sperzel directly. Most Custom or Unusual Sperzel orders are averaging at 1 to 2 weeks ,*rarely longer. *This is often due to a huge increase in orders at Sperzel, or even the rare case where they are backordered on parts. If this happens to your order: please be patient, because there is really nothing I (or Sperzel) can do about slow orders, and/or backorders. I can definitely assure you that they are planning on getting your orders out to you as soon as possible; it is definitely a high priority to them. I can also assure you that it will be well worth the wait when you get your cool new custom set of Sperzels!! However, Sperzel will except returns for -exchange- on any items that are defective. PLEASE FIRST MAKE SURE THEY WILL FIT ON YOUR INSTRUMENT BY CAREFULLY READING Sperzel Specifications.